Summary: Researchers have developed new tests and math models to help quantify automatic moral and empathetic judgement. When people scan the latest political headlines or watch a video from a war-ravaged land, they tend to feel snap ethical or moral responses first and reason through them later. Now a team of psychologists have developed new tests and mathematical models that help to capture and quantify those snap moral and empathetic judgments. In a series of studies that looked at people’s intuitive moral judgments and empathic responses, the researchers found that certain situations could trigger instant moral and empathetic assessments, even when they were directed to counteract those feelings. Cameron added that although much work remains, these measures for intuitive moral judgment and empathy could lead to tests to help criminologists and psychologists better understand pathological behavior. Cameron’s laboratory is currently extending the tasks to understand moral intuitions and empathy for pain in clinical and incarcerated populations. Victoria Spring, a graduate student in psychology who works with Cameron and a co-author on the empathy paper, said that the new test of empathy avoids self-report, which may be influenced by outside sources. The researchers, who released their findings on the study on moral judgment in a recent issue of Cognition, created an implicit task that measures moral judgment without self-report, called the moral categorization task. They recruited 444 people to take part in the study. As part of the task, participants see two words — a prime and a target — that flashed on a computer screen in quick succession. The first word, or prime, appeared for about 100 milliseconds — about as long as a blink of an eye — followed by a second word, or target word. The participant is asked to disregard the prime and make a moral judgment on whether the target word is wrong or neutral, or somewhere in between, in under a second. Morally wrong terms included “genocide,” “stealing” and “torture,” among others. “Whistling,” “leisure” and “passage” were among the morally neutral terms. The researchers were able to take this data and create a statistical model that could show whether the performance on the task was related to gut moral reactions or whether the participant’s reactions were related to other factors that could affect control. “For example, maybe if you’re tired, your executive control is reduced and that might shape your performance,” Cameron said. Participants in the study on empathy were asked to react quickly to an image and determine whether or not the image displayed something painful. NeuroscienceNews.com image is credited to Patrick Mansell. The team found that automatic moral intuitions, as captured by the mathematical model, were reduced for people who rated higher on psychopathy and increased for people who tend to feel more guilt. The model also showed that these intuitions matched up with real-world voting behavior. The researchers found similar effects in the study on empathy. Empathy is the ability to share in and resonate with others’ experiences, such as pain. In that series of studies, published in the journal Emotion, 617 participants were recruited to complete an implicit measure for empathy without relying on self-report, called the pain identification task. This approach is similar to the study on moral judgment, except that participants see images instead of words. The subjects were again presented with a prime image, followed by a target image, and told not to allow the prime to change their answer. 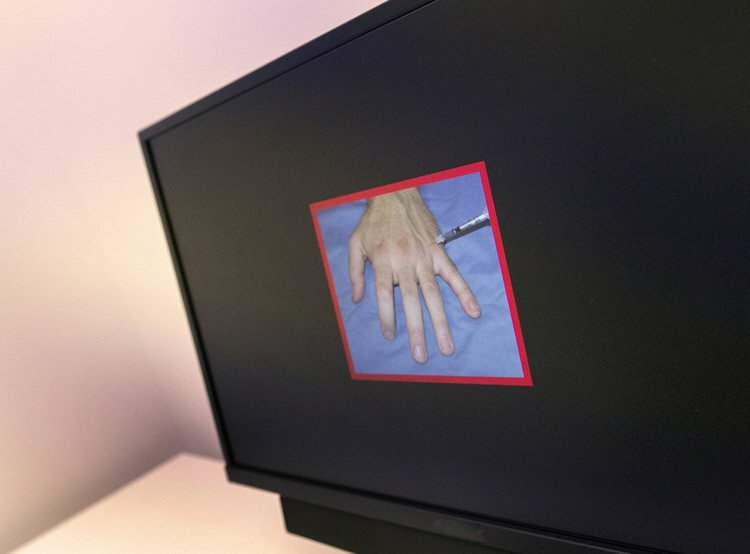 The prime or target images were either a picture of a needle painfully piercing a hand, or a Q-tip brushing against a finger. Participants, who were asked to disregard the first image, were expected to answer in under a second whether the experience displayed in the target image was painful or not. Cameron said that the prime image — whether painful or not — did influence the person’s response to the target photo. Automatic empathy, as captured in the mathematical model, was also associated with charitable donations. “These measures of intuitive moral and empathic reactions, by moving beyond self-report and using mathematical modeling to quantify these processes, can hopefully spur new theoretical developments and practical applications in the study of human morality,” said Cameron. In the study on empathy, Cameron also worked with Andrew R. Todd, assistant professor of psychology and brain sciences, University of Iowa. In the study on moral evaluations, he worked with B. Keith Payne, professor of psychology and neuroscience, University of North Carolina; Walter Sinnott-Armstrong, Chauncey Stillman Professor of Practical Ethics in the Department of Philosophy and the Kenan Institute for Ethics, Duke University; Julian A. Scheffer, graduate student in psychology and Michael Inzlicht, professor of psychology, University of Toronto. Image Source: NeuroscienceNews.com image is credited to Patrick Mansell. Penn State “Tests Can Help Quantify Automatic Empathy and Moral Intuitions.” NeuroscienceNews. NeuroscienceNews, 29 March 2017. Penn State “Tests Can Help Quantify Automatic Empathy and Moral Intuitions.” http://neurosciencenews.com/moral-ethical-intuition-6309/ (accessed March 29, 2017). Implicit moral evaluations—i.e., immediate, unintentional assessments of the wrongness of actions or persons—play a central role in supporting moral behavior in everyday life. Yet little research has employed methods that rigorously measure individual differences in implicit moral evaluations. In five experiments, we develop a new sequential priming measure—the Moral Categorization Task—and a multinomial model that decomposes judgment on this task into multiple component processes. These include implicit moral evaluations of moral transgression primes (Unintentional Judgment), accurate moral judgments about target actions (Intentional Judgment), and a directional tendency to judge actions as morally wrong (Response Bias). Speeded response deadlines reduced Intentional Judgment but not Unintentional Judgment (Experiment 1). Unintentional Judgment was stronger toward moral transgression primes than non-moral negative primes (Experiments 2–4). Intentional Judgment was associated with increased error-related negativity, a neurophysiological indicator of behavioral control (Experiment 4). Finally, people who voted for an anti-gay marriage amendment had stronger Unintentional Judgment toward gay marriage primes (Experiment 5). Across Experiments 1–4, implicit moral evaluations converged with moral personality: Unintentional Judgment about wrong primes, but not negative primes, was negatively associated with psychopathic tendencies and positively associated with moral identity and guilt proneness. Theoretical and practical applications of formal modeling for moral psychology are discussed.